Monday night at Downstage Theatre in Welly: my dear friend Eric is part of the Pecha Kucha lineup, talking about the show wot I wrote, Affair of the Diamond Necklace. A Pecha Kucha night is an event format in which presenters show a slideshow of 20 images, each of which is shown for 20 seconds. Pecha Kucha Wgtn details here. Door sales only, $9 cash – Downstage Theatre, doors open: 6.30pm, start 7.30pm. Be great to see people there. I won’t be online again until Tuesday I think, so don’t bother emailing to co-ordinate – just show up if you’re keen. The Affair of the Diamond Necklace is coming back to Wellington in December. There was an August show, which I’ve written about before. We’re back for another go Saturday December 12. A full evening of interactive entertainment including Vector Orchestra performance and a very nice meal. Will be an excellent night I’m sure! We’ve been tightening things up, learning the lessons of last time out – a few script changes, etc. Rehearsals for the return version kick off tonight – this time I’m leading rehearsals, another new experience for me! But looking forward to seeing the team again. It’s an excellent bunch of people. More information at the Eklektus website. Including a few photos, including me in a white wig. Thoroughly caught up in the world of Marie Antoinette for The Affair of the Diamond Necklace, which is on Saturday evening. Today, I smashed a plate by letting it fall from my head. That’s a new one. But the dances are going rather well I think. There are still tickets to be had, if anyone is feeling keen. It will be a spectacular evening in every way. But while the spectacle is being prepared, blogging will be light. Yesterday the afternoon was spent in the Hippopotamus restaurant, filming a segment for TV3’s Nightline late edition news show. Nightline does like its quirky culture bits to round off the evening, and we’re lined up for Monday’s show tonight’s show! 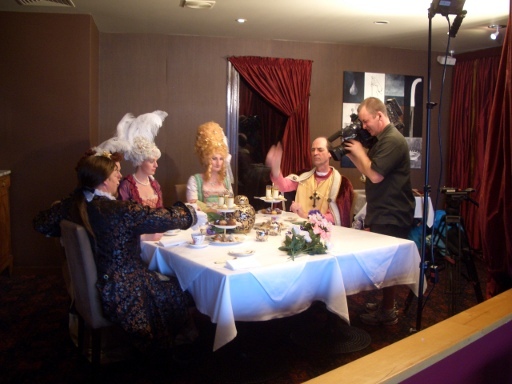 We had five costumed performers enjoying High Tea, improvising like mad and gesticulating for the cameras. Eric (of the “how to behave” video) was interviewed, then a couple of the performers (one in-character, one out). The whole experience was good fun, and low-stress once it got rolling. Reporter Tova and cameraman Dan made smart decisions fast and pulled good signal out of a lot of noise; it was obvious they were both building the piece up from nothing in their heads as they went. Nice to watch. And the Hippopotamus was amazing – very accommodating and helpful. Their high tea is wonderful! I mean to go back and check out the evening menu some time, executive chef Laurent Loudeauc spent a while watching what was happening and he seemed to be a nice gent, and the food definitely sounds amazing. So, nice work everyone! There’ll be more photos up on the Flickr photostream soon, I hope. And we should be on Nightline on Monday! So I’ve been directing the rehearsals for the Affair of the Diamond Necklace remount (December 12! One Show Only!) and have found it an interesting and challenging experience. I don’t have much experience with directing of any sort. Back in high school for the odd short bit, but since then – nothing. Steep learning curve! What it reminds me of most, actually, is editing. Editing is the part of writing that you don’t hear much about – the bit where you kick your opus hard to find the weak points, then tear out all the stuff that comes loose. In a theatrical experience, though, the text isn’t really up for grabs in the same way, because everyone’s been committing their energy to learning it and big changes are unfeasible. We’ve messed around with some dialogue, but mostly it’s the way we use it that has changed. I’ve been blessed with very skilled performers who can bring a lot of smarts to the script and can talk about what works, what doesn’t and what might be worth a try. The atmosphere is collegial and supportive and that makes it easier for me to push some angles hard, send some performances in a different direction, and so on. The December remount is a straight-up better show than the August performance. We’ve tightened and sharpened and honed this beast and it plays like a dream. Love it. I’m not a Real Director. Naw, I know some Real Directors, and they have chops embracing the whole field of endeavour. But, in my small way, I feel like I’m doing something good at the head of this team. I know for sure we’ve made something good into something great – and isn’t that the trick of it? And don’t forget the first beautiful trailer. Over the weekend we held auditions for Affair of the Diamond Necklace. One of our lovely performers is unfortunately unavailable for the remount, so we needed to recast promptly. It’s the first time I’ve been involved in auditions and it was really quite tricky. Anyway, it fell to me to make the decision, and really it was a no-lose situation – all the people we saw would kill in the part – but I tried to find a good process. So I went with my gut, tried to talk myself out of it with my brain, and when I failed to do so, found that the decision was made. Then came the hardest part, which was phoning the unsuccessful people to tell them they didn’t get it. Thankfully everyone’s professional and they made it very easy on me! So now we’ve got a full cast again. Rehearsal tonight – looking forward to it! Regarding tne short-stories target for the year, I’m on track. I have eleven complete stories drafted and one more in progress, with two months to go. Note that there’s still a ways before I hit target, as the original plan was to only count stories as done when I am comfortable submitting them places. I’m only at that point with a couple of these. So there’s editing binge coming. Note that “walking story” is one of the really early ones that I wrote and then decided was unsalvageable. Well, I think I’ve figured it out. This revision keeps the characters, the critical incident, and about 20% of the opening sequence. Still working on it. Sinking energy into revised script for “Affair of the Diamond Necklace”. More on that soon. Spent half an hour today chewing over one line of dialogue – it really needs to drop heavy, and it was defeating me. Think I solved it though. Might change mind tomorrow. Still noodling on “Lament” role-playing game idea. Not a single one of them is really ready for prime-time though, they all need at least an edit if not more. Only five of them have been out to other human beings for comment, four of them exist solely as pen-in-notebook scribbles, so got to get those typed up. Still work to do! I’m seeing some themes/types coming through in my stories, also; maybe I’ll try and break out of that for the last three pieces. Maybe not. “The Beast” comic ticks along. Having meetings about the follow-up to “Affair of the Diamond Necklace”. “Ron the Body” is still inert. Must get that submission train rolling again, so easy to slack off on it. And working away also on “Lament”, a role-playing game I’ve had in my to-do list for years, Mr 2Trees did some wonderful art for it a few years back. Enjoying that process. Still working on tne twelve short stories target for the year. In other words, got a long ways to go yet. But I’m learning a lot about short stories, so that’s good. “The Beast” comic keeps on keeping on, looking handsome. Re-writing dialogue to best fit a drawn page is a whole new writing skill. Awesome though. “Affair of the Diamond Necklace” was performed and went well. Sweet. A couple other small Sekret Projects too but nothing particularly dramatic. No movement on Ron the Body.